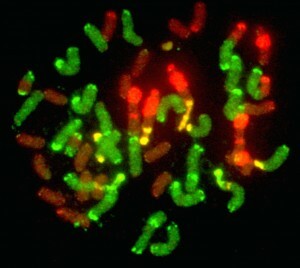 Polyploidy, a change whereby the entire chromosome set is multiplied, arises through mitotic or meiotic misdivisions and frequently involves unreduced gametes and interspecific hybridization. The success of newly formed angiosperm polyploids is partly attributable to their highly plastic genome structure, as manifested by tolerance to changing chromosome numbers (aneuploidy and polyploidy), genome size, (retro)transposable element mobility, insertions, deletions, and epigenome restructuring. The ability to withstand large-scale changes, frequently within one or a few generations, is associated with a restructuring of the transcriptome, metabolome, and proteome and can result in an altered phenotype and ecology. Thus, polyploid-induced changes can generate individuals that are able to exploit new niches or to outcompete progenitor species. This process has been a major driving force behind the divergence of the angiosperms and their biodiversity (Leitch AR, Leitch IJ. 2008. Perspective – Genomic plasticity and the diversity of polyploid plants. Science 320(5875): 481-483). We have three central questions, if you are interested in research into these areas please contact me. What are genetic consequences of polyploidy for genes and genome structures? Why are polyploids so successful in angiosperms? What are the costs of polyploidy in ecology? I have over many years studied polyploidy in a range of species and genera, especially in Nicotiana, Triticum (wheat), Rubus, Agave, Spartina, Tragopogon and others.